The DEM-410CX module provides enterprises with a highly affordable, low-latency 10-Gigabit network connection on the twin-axial copper cable. Significantly lower in cost than the fiber fable, this copper cable supports distances ranging up to 5 metres, depending on wire gauge. The CX4 port module does not require any transceiver to be installed, eliminating the need for costly fiber transceivers. The CX4 port module slides into an open slot of a D-Link Gigabit switch. The port provides a very high bandwidth of 20-Gigabit operating in the full duplex mode. It can be used to stack the switches together in a very high bandwidth stacking scheme, or to uplink them to core chassis switches. It can also be deployed to connect to servers or network storage devices with CX4 support. 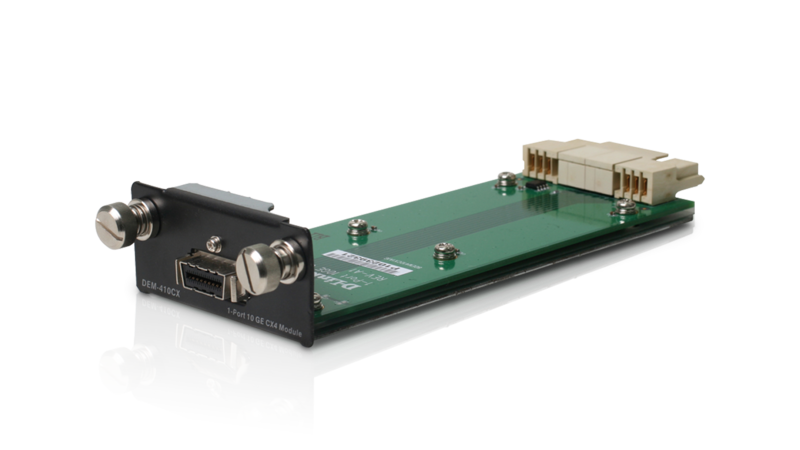 The CX4 port module is thus an ideal solution for high-bandwidth network connections in high-performance computing clusters and for short distances within wiring closets.